You sometimes have to change your wardrobe and wear different clothes to save yourself from the embarrassment of showing dark underarms. 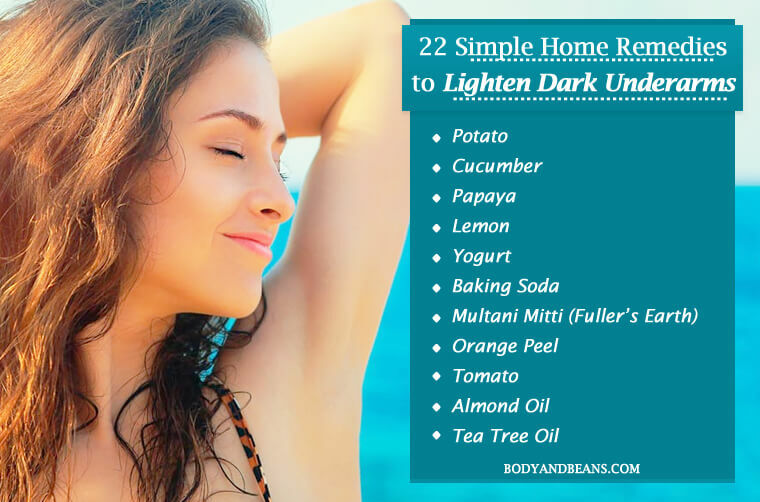 I have seen many of you face this problem so I thought of sharing with you 22 coolest and easy to apply remedies that will help you to lighten dark underarms easily and naturally. No matter how well dressed you are, but the dark underarm may spoils your day. No one likes dark underarms and I have seen many who find it really difficult to get it right. But it is actually possible to lighten dark underarms and that’s what we are going to discuss in today’s post. Fashion and style is very important as far as modern lifestyle is concerned. Today’s generation is very much attracted to the fashionable clothes, which their favourite hero or heroine flaunts. Therefore, there is somewhat a craze among young men and women to look just perfect and gorgeous like their role models. Alternatively, even if you do not copy anyone, you simply love looking fashionable, classy and sophisticated. Isn’t it? But wait, with dark underarms? Young females spend so much money on their makeup, dresses, hair, cosmetics and the list goes on. Especially summer means flowing dresses and cottons. It also means lounging by the pool in a swimsuit and pulling out all the gorgeous sleeveless tops. Everything about summer is sunny, gorgeous, and lovely except dark underarms. That is the only thing coming between you and those lovely dresses and spaghetti tops and swimsuits. Ok so before talking about the remedies let me brief you about the causes, which in turn might help you in preventing it. Diabetes and insulin resistance are two major causes of acanthosis nigricans. It is also found in individuals with Addison disease, pituitary problems, hypothyroidism, or those undergoing growth hormone therapy, using oral contraceptives or cholesterol medications containing nicotinic acid. It can affect any part of the body with folds, including the underarms. So, if your dark underarm is due to this condition, it is always advisable to take medical help. You must have read the causal factors behind dark underarms carefully. Therefore, by the time you already know, which things are a complete no-no if you want to avoid dark underarms. However, if you are already facing this problem, here are some of the best remedies to lighten dark underarms that are safe, effective, natural and affordable. Potato has a mild acidic property that makes it a great natural bleaching agent and can be used to lighten dark underarms. Unlike other strong bleaching agents, it is anti-irritant. In order to lighten your underarm, all that you have to do is to rub freshly cut slices of raw potato on your underarms. Else, you can extract the juice from the raw potato and apply the juice on the affected area. Let it dry for 15-20 minutes and then wash it with lukewarm water. For best results, repeat any of the two processes daily twice. Potato will also provide instant relief from patchiness and itchiness that may develop due to pigmentation. 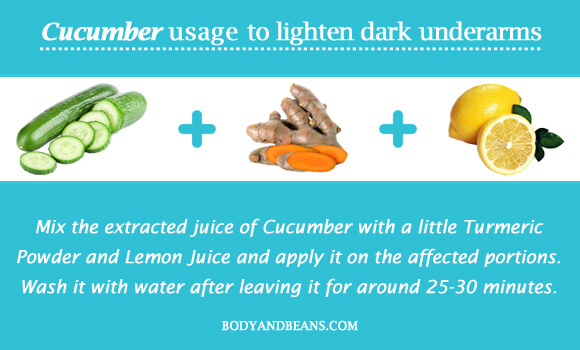 Just like potato, cucumber is another natural bleaching agent, which can be used to lighten dark underarms. You can rub a cucumber slice on your underarms or simply grate the cucumber and apply the extracted juice on the affected area once or twice daily. Another method is to mix the extracted juice with a little turmeric powder and lemon juice and apply it on the affected portions. Wash it with water after leaving it for around 25-30 minutes. 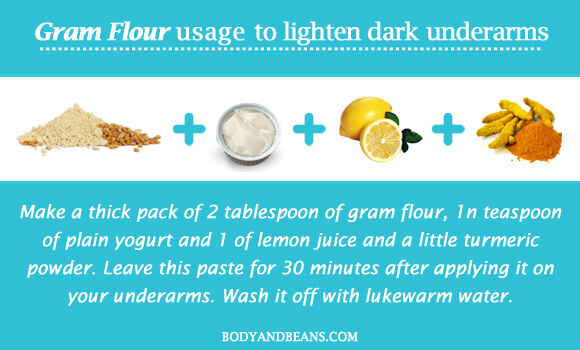 This paste works like a very effective remedy to lighten dark underarms. Papaya is a sweet home remedy for pigmented underarms. It contains natural enzymes that can lighten and exfoliate skin. The process of application is very simple. Cut a papaya and rub the freshly cut pieces directly on your underarms. Leave it for 20-30 minutes and then wash it off thoroughly. In a week, you can repeat it for at least 3-4 times and it will help you to lighten your underarms in just a few weeks. By the time I think you have got the hint that lemon is effective for this purpose when I mentioned lemon juice in my other point. Well yes even lemon acts as natural bleach and a powerful antibacterial and antiseptic agent. Rub a lemon wedge on the skin for a few minutes. 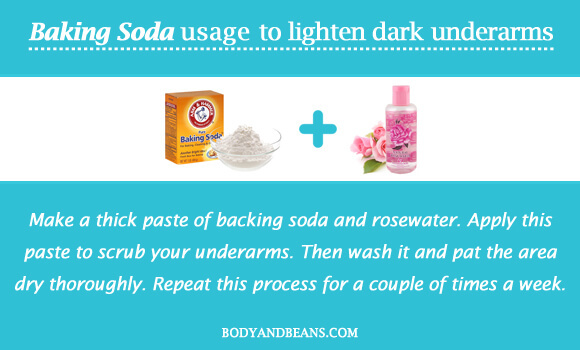 This will help you remove the dead skin cells, which are one of the factors for dark underarms. Leave the juice on your skin for about 10-15 minutes and then wash the area thoroughly. You can sprinkle a little sugar on the lemon wedge and then use it for more exfoliating results. Do this a few times a week and you are sorted. Another method is to mix a little turmeric powder, honey or plain yogurt in some lemon juice and apply it to your underarms. Leave it on for about 10 minutes and then wash it off. Repeat three or four times a week. However, you can apply a moisturizer after using lemon as it often leaves the skin dry. Make a paste of 2 tablespoon of yogurt and 1 tablespoon of honey. Apply this mixture on the underarms and rub it in gentle motion. After 10 minutes, rinse it off with normal water. The combination of yogurt and honey cleanse the skin off the impurities and helps lightening your underarms. This is another important ingredient that can be used as an exfoliating scrub. This also helps to remove the dead skin cells as well as unclog skin pores. Make a thick paste of backing soda and water. Apply this paste to scrub your underarms. Then wash it and pat the area dry thoroughly. Repeat this process for a couple of times a week. You can also add rosewater instead of using plain water. Besides, if you suffer from body odor, you can apply a light dusting of equal parts of baking soda and cornstarch. This will help to neutralize the body odor. Multani mitti is natural clay that absorbs impurities from the skin and decongests all clogged pores. It also helps in exfoliating the dead skin cells, leading to the lightening of the underarms. 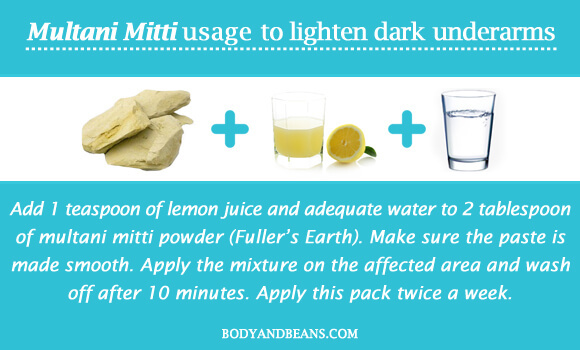 Add 1 teaspoon of lemon juice and adequate water to 2 tablespoon of multani mitti powder. Make sure the paste is made smooth. Apply the mixture on the affected area and wash off after 10 minutes. Apply this pack twice a week. Orange also has exfoliating and skin lightening properties. 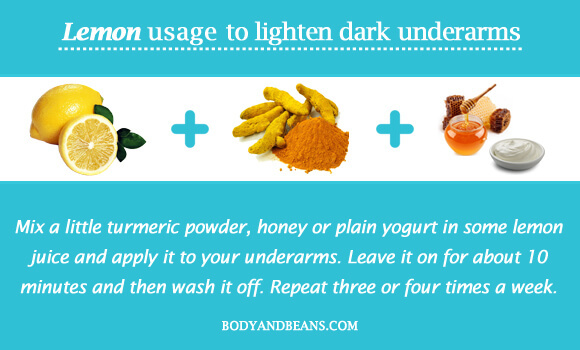 Here is the way you can use it to lighten dark underarms. Take some orange peels and let it dry completely in the sun for a few days. Then grind the dried peels into powder form. 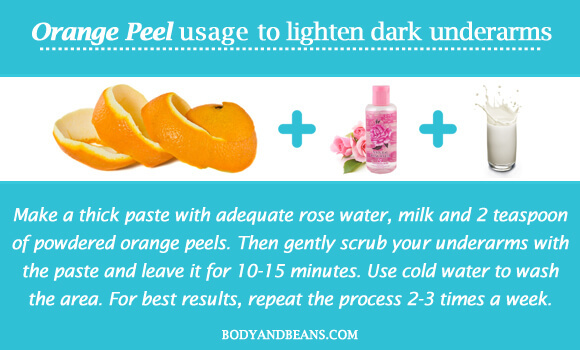 Make a thick paste with adequate rose water, milk and 2 teaspoon of powdered orange peels. Then gently scrub your underarms with the paste and leave it for 10-15 minutes. Use cold water to wash the area. For best results, repeat the process 2-3 times a week. The acidic properties of a tomato is apt for skin lightening. Take a tomato and extract the juices from it. Apply this freshly extracted juice on your underarms and then wash it off after 20 minutes. Do this on a regular basis and you will get lighter underarms. Castor oil absorbs all the impurities present on your skin and even cleans out your pores. All the dirt, excess oil, and dead cells are removed to reveal lighter skin in your underarms. 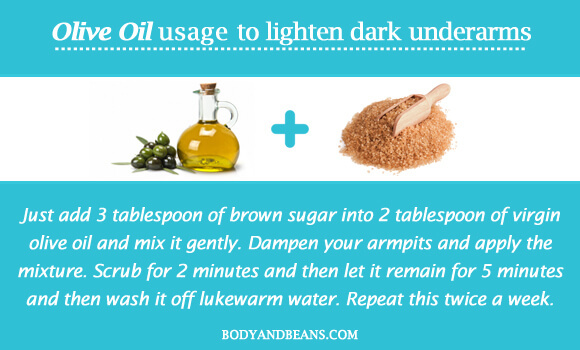 Take 2 teaspoon of castor oil and rub it gently on your underarms for around 5 minutes. Then take shower. You can use this simple technique daily. Castor oil is also an excellent skin conditioner. Coconut oil has Vitamin E that helps to lighten the underarms. Massage your underarms with coconut oil. Leave it for 10-15 minutes. Use a mild soap and lukewarm water to wash it off. You can repeat this process 2-3 times daily for best results. Coconut oil besides lightening your underarms acts as a natural and effective deodorant as well. Almonds contain potent phytochemicals that lighten and brighten the dark underarm skin in just a couple of applications. All you need to do is to massage your armpits with a few drops of almond oil for around 10 minutes. Repeat this on a daily basis. They are natural bleaching agents. In addition, the vitamin E present in the almond oil will keep you rejuvenated. Olive oil is very hydrating and nourishing for the skin. It is also rich in antioxidants. The brown sugar acts as an exfoliant by removing the dead skin cells that have accumulated and made your underarm skin darker. Just add 3 tablespoon of brown sugar into 2 tablespoon of virgin olive oil and mix it gently. Dampen your armpits and apply the mixture. Scrub for 2 minutes and then let it remain for 5 minutes and then wash it off lukewarm water. Repeat this twice a week. Tea tree oil not only lightens the underarm skin but also keeps the area odor-free. The antioxidants present in this essential oil will keep your skin healthy. Its antimicrobial properties will kill the microbes present and deodorize the area. Take a note of the procedure. Take a cup of water and pour it into a small spray bottle. Add 4-5 drops of tea tree oil and shake it well. Spray the mixture on your dark armpits and let it dry naturally. Use this daily. However, do not forget to do a patch test as the high concentration of this oil often leads to skin reactions. The rich vitamin E content in this oil helps in keeping the skin fresh and radiant. It also improves circulation to the area it is applied on. Massage the armpits with few drops of sunflower oil for a minute or two. Leave the oil for 15-20 minutes and then rinse with warm water. Repeat this twice a day for best results. Milk is an important ingredient as far as dark underarms is concerned. This is because of the presence of vitamins and fatty acids. It also contains lactic acid that further aids in the underarm whitening process. Make a thick paste by adding 2 teaspoons of full fat milk, 2 tablespoon of flour and 1 teaspoon of plain yogurt. Apply it on the affected area and leave it for 15 minutes before washing it with cold water. Repeat this process daily. You can also use another method. 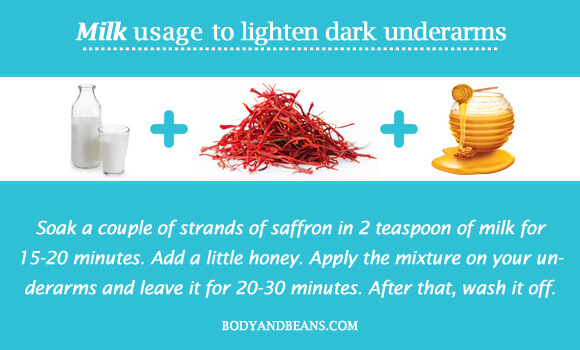 Soak a couple of strands of saffron in 2 teaspoon of milk for 15-20 minutes. Add a little honey. Apply the mixture on your underarms and leave it for 20-30 minutes. After that, wash it off. Milk will soften your skin and make your skin tone lighter. For some, application of a paste of milk and turmeric powder on the dark armpits and then washing it off after 10 minutes also works wonders. 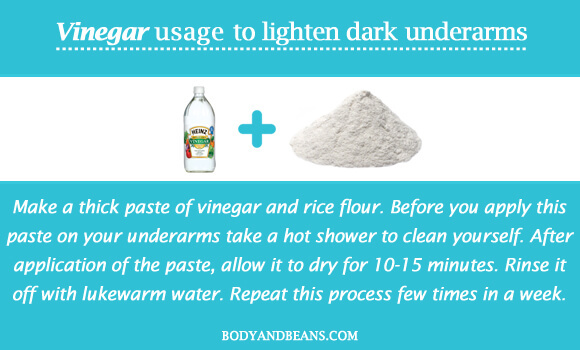 Vinegar is also very essential to lighten dark underarms. Just make a thick paste of vinegar and rice flour. Before you apply this paste on your underarms take a hot shower to clean yourself. After application of the paste, allow it to dry for 10-15 minutes. Rinse it off with lukewarm water. Repeat this process few times in a week. Vinegar also kills the bacteria and other germs that feed on dead skin causing underarm odor. Sandalwood has skin lightening properties. 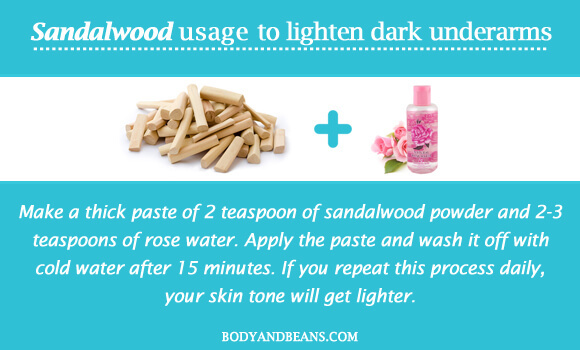 Make a thick paste of 2 teaspoon of sandalwood powder and 2-3 teaspoons of rose water. Apply the paste and wash it off with cold water after 15 minutes. If you repeat this process daily, your skin tone will get lighter. Besides, if you develop body odor from excessive sweating, the fragrance of sandal will help you get rid of it. Gram flour popularly known as “besan” is very much beneficial as far as dark underarms are concerned. Make a thick pack of 2 tablespoon of gram flour, 1n teaspoon of plain yogurt and 1 of lemon juice and a little turmeric powder. Leave this paste for 30 minutes after applying it on your underarms. Wash it off with lukewarm water. You can apply the paste on daily basis for desired results. This easy homemade pack is excellent for making your skin lighter, softer and smoother. Alum disinfects the skin and also balances the skin’s pH. It thus eliminates all the harmful microbes, responsible for itchiness and sweating (which cause dark armpits). Take 2 teaspoon of alum powder and mix it with water. Apply this paste on the armpits and leave it for 15 minutes. Then take a shower. You can apply this paste once or twice a week. Do not forget to do a patch test, as it might not suit everybody. According to this research, aloesin found in aloe vera gel is a tyrosinase inhibitor, an enzyme that is responsible for skin pigmentation. By hindering the activity of this enzyme, aloe vera can lighten discolored armpits. It is also antibacterial in nature and soothing for inflamed/irritated skin. The process of using aloe vera is pretty simple. Just take an aloe leaf, cut the leaf, and extract the fresh aloe vera gel. Apply a layer of this gel on your armpits and wash it off after 15 minutes. Repeat the procedure every alternate day. Use organic aloe vera gel if you do not have an aloe plant at home. This is a naturally occurring stone that has been used for centuries as an exfoliant. It is also essential for removing the dark patches on the underarms. Wet the pumice stone and gently scrub the underarms for a few minutes before taking a shower. Do this twice or thrice a week to get improved results. Ok I hope you all have read the above-mentioned list of 22 simple, natural and easy to implement remedies to lighten dark underarms. However, if you ask for my suggestion, I think waxing is a better and effective hair removal process that cause minimal damage to the skin in comparison to the damage that the harsh razors or hair removal creams cause. Further waxing also lightens your skin. Therefore, women, you better opt for this alternate if you want to prevent darkening of your underarms. Although I am sure that, these natural methods will work wonders but in any circumstance if you find that despite using these, there is no improvement in your case, do not forget to knock a doctor because yours might be due to some other ailment in your body. Do not delay it further in such a case. Moreover, remember that the skin type of each individual is different from one another. So please do not forget to do a patch test before using the tricks and techniques. Are you having dark underarms? Have you tried any of these remedies in the past? If so, feel free to share your experience. And if you know any other tips or remedies that may help in lightening the darker underarms, then feel free to share by commenting below.